QUESTION: What is the Multi-Bulkhead Bonding System™? ANSWER: A labor-intensive construction method by which floors, stringers, bulkheads, shelves, and frames are bonded with heavy fiberglass laminates. Resulting in a solid strong matrix. 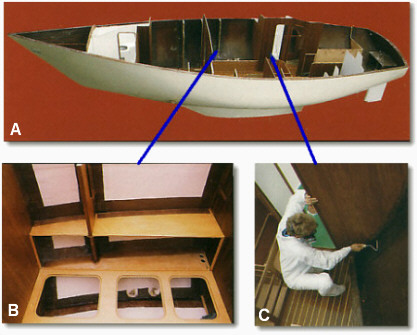 Primary sea, keel, and rig loads are spread over the entire hull, preventing concentrated point loading. A. For strength, no large interior fiberglass liners or fiberglass pans are used with this construction method. B. The main salon area is an example of how all LRC models are built. Note how every horizontal and vertical surface is taped into position for tremendous strength. C. A bulkhead being glassed in place, top to bottom, with no fiberglass pans or liners to obstruct the bonding process. “The hull must be locally strengthened to withstand loads imposed by the mast and rigging, the ballast keel, and the rudder (if skeg-mounted or spade). All these loads must be spread out over an area as large as practicable. Bulkheads and vertical floors are the best way to distribute the stresses from ballast weight and mast compression.